The Chicago Cubs will be facing an interesting challenge over the weekend as they face the Los Angeles Angels for an interleague battle at Wrigley Field. The Cubs and Angels don’t face-off very often under Major League Baseball’s current interleague system, having last played during the 2016 season. Both teams enter the matchup brimming with confidence, as the Angels have won their last six games, including a three-game sweep over the Milwaukee Brewers. They won those games despite losing Mike Trout to a groin injury. The outfielder is day-to-day, but he won’t be in the lineup on Friday when the two teams open up their series at Wrigley Field. As for the Cubs, they are coming off their first series victory of the season, which they clinched with a 2-0 victory over the Pittsburgh Pirates at a rain-soaked Wrigley Field on Thursday night. Jose Quintana was dominant in the game, pitching seven scoreless innings, and the Cubs’ offense finally broke through in the seventh inning to seal the victory. Unfortunately for the Cubs, the Angels have had ample rest since their series against the Brewers ended, and they will be the fresher team by far as the two clubs square off at 1:20 p.m. on Friday afternoon. Hamels has had a lot of success historically against the Angels, posting a 4-2 record and a 2.80 ERA in 11 career starts against them. Skaggs has been off to a good start for the Halos, with a 2.45 ERA in a pair of starts. 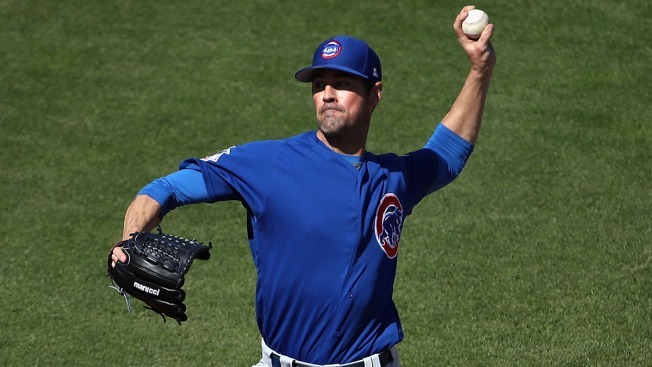 Hendricks has been struggling in the early going, as he often has during his career with the Cubs. He has not made it out of the fifth inning in either of his starts, giving up 11 total runs, six of which have been earned. He has also walked four batters while striking out eight, and he’ll be looking to turn things around a bit on Saturday. Stratton has also struggled with similar issues, giving up 11 runs (six earned) in 8.1 innings of work so far this season. He has struggled with his control, walking six batters, so look for Joe Maddon to try to get more patient hitters into the lineup, including Daniel Descalso and Ben Zobrist. The most interesting pitching matchup of the weekend could come on Sunday (weather permitting), as former Cubs hurler Trevor Cahill squares off against fill-in starter Tyler Chatwood, who will be pitching in place of the injured Jon Lester. Cahill gave up two runs on five hits in his last start against the Brewers and is settling into the role nicely. For Chatwood, this will be his first start of the season, as he’s given up four runs in six innings of work as a reliever this season.